Coffee cake may just be the best invention ever. Really, whenever you can’t decide whether to categorize a recipe as breakfast or dessert, and finally decide it belongs in both? That’s awesome. Cake for breakfast. And not just any cake! Apple cinnamon coffee cake with a salted caramel glaze. Because as you will recall, I am now putting salted caramel on everything. 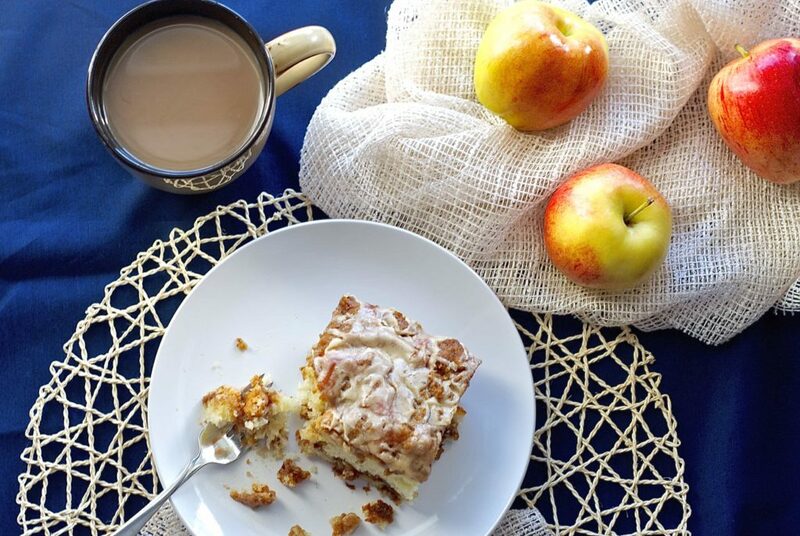 And it definitely belonged on this apple cinnamon coffee cake. Apples and salted caramel obviously go together. This cake is soft and fluffy with a brown sugar and cinnamon apple filling, topped with cinnamon and brown sugar crumbs, and is finished with a drizzled salted caramel glaze. In short, it’s amazing. It’s not a health food, but then, I did say I had trouble deciding where to categorize it! I had it for breakfast, cause I like cake for breakfast, but if you’re not on board with that you could certainly enjoy it for dessert! The recipe looks really long, but don’t be scared off by that, it’s all really easy steps. And you could definitely leave the glaze off if you want. But don’t, it was awesome. Also, I can’t really say how long it would take to make everything, but I would guess only about 20 minutes, if you don’t have 2 small boys interrupting you every 2.4 seconds. It took me about an hour, but that was with about 32958 interruptions for help with something. So you can make it faster than that. Ironically enough, as soon as I put it in the oven, those 2 boys could suddenly play happily with no help from me for the next 2 hours. Go figure! I started off making my mom’s apple cinnamon coffee cake, but this isn’t really it. I can’t leave a recipe well enough alone. But I would say that her recipe inspired this one. Coffee cake is one of those nostalgic foods for me. Does everyone have those? I would imagine. You know, those foods that automatically conjure up childhood. I think that a lot of foods are like that, everyone associates different foods with a time or place, a person. 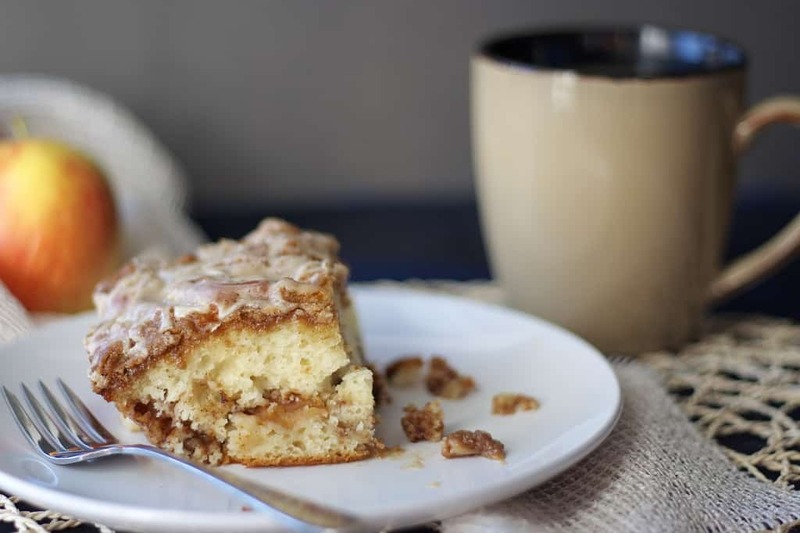 To me, coffee cake will always be one of those foods that is best in my mom’s kitchen with, of course, a mug of hot coffee. She’s made it as long as I can remember and it was always the perfect treat. It’s not something I make often. I can probably count on one hand the number of times that I’ve actually made it in the last 15 years, but when I do it’s like I’m having coffee with my mom. I’ll have to make it again next time she’s around so we can have the coffee together over my recreation of her recipe! Because cake for breakfast is really the best kind of treat. And it’s better with company. That’s just a fact. Preheat the oven to 350 degrees F. Lightly spray an 8x8 inch baking pan with cooking spray. Set aside. In a small bowl, make the topping by mixing the flour, brown sugar and cinnamon until combined. Cut in the butter with a pastry cutter or two knives until the mixture looks like crumbs. Set aside. Sift together the flour, sugar, baking powder and salt for the cake into a large bowl. In a small bowl or measuring cup, whisk together the eggs, oil and buttermilk. Pour this mixture into the dry ingredients and whisk together until just combined. In another bowl, toss together the apples, brown sugar, flour and cinnamon for the filling. Pour about half the cake batter into the prepared pan (just eyeball it, it doesn’t need to be exact! ), then spoon the apple mixture over top, spreading it out evenly, and cover the apples with the rest of the cake batter. Sprinkle the topping crumb mixture over top of the cake, as evenly as possible. Bake for 50-60 minutes or until a toothpick inserted in the center of the cake comes out clean. Allow to cool for 5-10 minutes. While the cake is cooling, make the glaze. In a small bowl, whisk together the icing sugar, heavy cream and salted caramel sauce until well combined. Drizzle over the slightly cooled cake. Serve warm. If not enjoying it right away, cover tightly with plastic wrap. It will keep well for 3-4 days at room temperature if covered tightly, and reheats well in the microwave. This cake is a huuuuuge stunner! Love it! this looks delicious, but that salted caramel glaze!!! that's such an awesome idea ;-) I love it! Cake for breakfast? Sign me up! Coffee cakes were always my favorite, especially with a cinnamon crumb topping! I could never resist a big slice and would love one right now! That glaze is just calling my name! I know, cinnamon crumb topping on a cake is just the best! So good! Thanks Kelly! Salted Caramel Glaze. I love how it just rolls off the tongue! 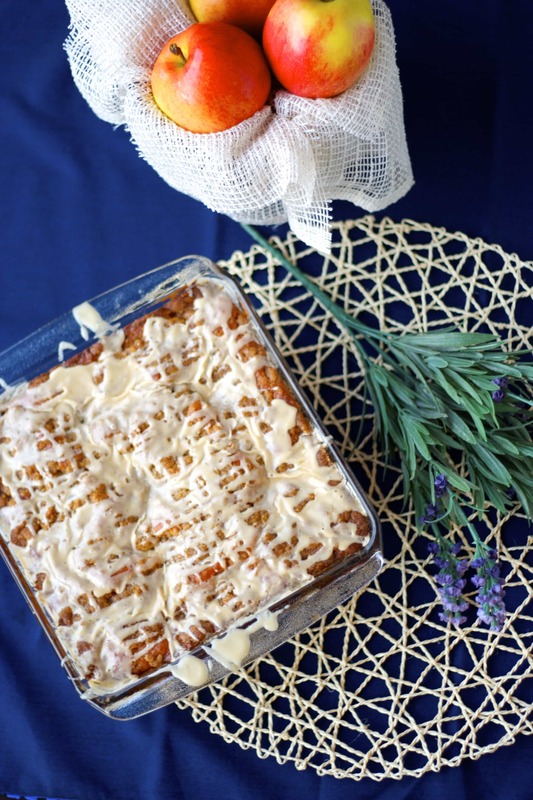 We're visiting family this weekend and this coffee cake would be a perfect hostess gift! Coffee cake really is one of the best inventions ever - cake for breakfast? Absolutely! This one looks so so good! Crumb cake is super nostalgic for me - it was always such a special treat when my dad picked one up from a local bakery growing up! So is coffee cake something you have with coffee rather than a cake containing coffee? That isn't something I have come across in the UK but what a great idea and as you say a perfect excuse to eat cake for breakfast! Yes, that's exactly what it is. It's a cake that's meant to have with your mid-morning coffee, you can often get it by the slice in coffee shops. Although making one that contains coffee sounds like a great idea! May have to work on that! Thanks for stopping by Anna! Thanks Arpita! Salted caramel and apples = awesome! Yum! Cake for breakfast is definitely the best invention ever :) Love that salted caramel, too....soooo good! I love coffee cakes and can have them any time of the day, with or without coffee :) This one looks amazing and it is on my to do list now ! Can I have 2 big slices please! Looks amazing Stacey...I love salted caramel...mmmmm bet this tasted divine. Pinned! Thanks Manali! It really did taste divine, I will need to make it again soon! Thanks for the pin! Oooh, you had me at salted caramel. I love this! The cinnamon part is also pretty awesome. Oh, salted caramel. I wish I could put salted caramel on everything. This sounds like such an amazing cake. You pretty much CAN put salted caramel on everything! It's dangerous. :) Thanks Dannii! Yes, please! I will take some! I'm totally with you on cake and desserts for breakfast. Love that breakfast is the one meal a day where we can eat sweets and pastries and it's considered acceptable. I would NEVER leave off a glaze! Haha! But I'm glad that I could in a pinch. Looks delicious! Hahaha, I actually often don't like a glaze on things, too sweet - but for some reason it seemed like a good idea when I made this and I loved it! It is funny that sweets are acceptable for breakfast hey? So strange, but I love it! Thanks Sarah! LOVE coffee cake! And apples and cinnamon... and caramel..... and just everything about this! I completely agree that coffee cakes are pretty much the best thing ever. I love that it can double as a breakfast, dessert, or pretty much anything in between! This apple cinnamon version looks fantastic, Stacey! I love the salted caramel glaze on top, gives it the perfect touch! Thank you Gayle! It's just the best when something doubles as breakfast and dessert right? !